I tore this phrase from a magazine, one of many I was tearing and cutting this weekend, preparing for an autumn of artwork, the need to get my hands messy quite big, and now I have a table for such, not the one I thought I wanted, but a better one, one that works in my small space; I bought it Saturday and spent the rest of the weekend reorganizing, cleaning, tossing, and that included old magazines and calendars and mail, and that included grabbing words before tossing - words to inspire me, phrases for prompts, pieces for collages. Dropped into the many bowls of words surrounding me, this phrase lay forgotten on the couch. I found it later, dropped it into a box of candles I've looked at for a year, the starting point for an assemblage, but no energy in my heart to move me forward. I dropped the words and then suddenly read them. Really read them - they jumped at me. And I knew this would be the phrase to bring me back to art, or at least back to attempting art - I haven't painted in 15 months, haven't glued, haven't hammered, haven't anything but typed words. And it 's been enough, more than enough, but I am at last ready for more. I've never been one of those folks who could paint her way out of a box of despair; I need happiness to begin that process, and it may be that the painting will tell you how angry I am, but it is contentment that moves me forward, that it is the first foot on the road, and I am healing. I feel the call. And so. This phrase. There is something quite Mad Men about these 6 little words, these little words that have nothing whatsoever to do with pretty and everything to do with power. I can't put into words the way I felt as I stood and stared at those 6 little words. I will have to put it into paint. And then I will give it away. To one of y'all. I've thought long and hard about this; this being my first giveaway, I wasn't sure how to approach it, and this may not be the right way, but here's how it will work. I'm giving myself a bit less than a month to finish this. It's a long time, I know, but it's been a while and I want no time pressure. During that month, I'd like you to think about this and come up with your own interpretation of these 6 little words - photo, painting, journal page, paragraph, poem, I care not. I just want to see it. And on September 23, the moon all full and female, I'll show you mine if you show me yours. I'll link to everyone's site or Flickr account and would like for you to link back to here. If you don't have a blog or Flickr or whatever, let me know and we'll figure something out - perhaps Facebook. If I can figure out how to make a button to paste onto your site, I'll do that, but I know me, so don't hold your breath. :) I'll drop all your names into a hat or a box or a bowl and I'll find someone to draw a name and that person will receive my painting. Because I need y'all to keep me going. And because I really want to see your stuff. 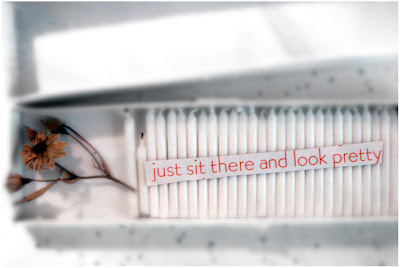 Don't just sit there and look pretty. I'll post the list on the sidebar. the first thing to make me want to get out of this rut of sadness of loss, of impending loss. I am jumping with you but I will not use words..
they are my crutch, I will require more of myself for this coming back out party. Yay! On all counts, yay! So glad to hear this from you, the table, the readiness, the moving forward. And love this idea. Fun and power and pretty, all in one. actually, i jumped in with both feet, my favorite bag and a box of cookies. don't try to do a code with it....too many headaches! and now you've given me some art inspiration...and i needed it desperately. oh I am clasping my hands in joy..that you are creating..reorganizing and all of the above..i am WAY in ..
it takes awhile for creativity to find its way to begin again.. I love it! That is a wonderful idea, so much more engaging than the usual giveaway. And you know I will be there, even if I don't have a clue about sitting pretty, which I absolutely don't. Okay - I'm in. This is a fabulous idea. September 23 - it's a date! Hmmmm... I think I know exactly what I will post... Can't wait, but I will. But shocking that you haven't painted for so long -- but I DO understand. I used to work in an art supply store (((for more years than I'd like to admit))) and know that artists do go through long dry-spells, from which they almost always emerge from as better artists with even more meaningful and sometimes completely unexpected nooks and crannys in their work. May the force be with you! not sure if i will put anything in but i know so well where you are coming from, my first daughter's first sone our first grandson passed away a bit over a year ago he was 7 weeks old and my creative side died too. i need to be happy i need to be able at least to smile to photograph to write to do anything much really. then 4 weeks ago she had a baby girl she is beautiful perfect and i am smilng again i feel like an onion the layers being peeled off to finally see again what is in the very heart of me. so i will see i have been slowly breathing again and i just wanted to say i know what you mean i know where you are coming from and i hope you get those wonderful creative juices flowing again. Oh, I am SO in. Plus, you know, my birthday is September 23rd. So, I'll be extra lucky that day. I just know it. Oh, one more thing. I LOVE this idea. LOVE as in ADORE! not in a harry loves sally way, but you get the idea. LOL! You think a month is a long time to finish a painting? To me, that's QUICK! I can sit, I can look pretty, and I can interpret, too:) I'm looking forward to this. What a beautiful idea! I would LOVE to participate. I just recently tore phrases from magazines that spoke to me somewhere deep inside and am loving where it's taking me. Thank you for the invitation and thank you to The Blue Muse for sharing it on her site so that I was able to find it! May I post an invite on my site and FB page for others to join too? Skye & Connie - I just wanted to let you know why y'all's names are below the others on my sidebar list. If you don't have a website or blog, Blogger won't let me add you to the first list. So I just started another list for those with no links. If you'd like, I can link to your FB pages, but don't want to do that without your permission. And to everyone else - Yayy!! I would've been so embarrassed if no one joined with me in this. Donald - I hope you're right & the force is with me. Paula - I know. I know. LOL! And Christina - I am so laughing!! Hmm strange, I thought I commented yesterday, but anyway, Count me in! love it! I'm in my fellow unraveler. the thing is something like that actually makes me think i could sit and look pretty!! Count me in, I love playing. A chance to win one of your paintings??!?!?!!!?? I could howl at the moon, sing to the stars, dance to the planet Jupiter! And to have a new project. I LOVE THIS!! Of course I am In!!! !Sept 23, working on it! I am inherently tied to MrsMediocrity forever. So I am in. It should take me about three weeks to figure out what I am doing and one night to frantically figure out what to pull together. You have such a lovely and very inspiring space here! So happy i found you via Kelly Lerky. :) This sounds like a wonderful challenge and for some reason i'm drawn to these words. So happy i found you. Have a lovely merry happy week and love to yoU! thank you for your honesty in this space...it's comforting to know i'm not the only artist with no art lately. it really is. here's a gift for YOU...a quote from the StoryPeople : For a long time, she flew only when she thought no one else was watching. L - That quote almost breaks my heart - it is that perfect. Thank you! well, shoot. i've been so busy just sitting and looking pretty, i almost plumb forgot about the formalities. the cookies, however, spurred me to action. works every time. Came over from Sally G.'s blog and love what I see here - TOTALLY IN. Thank you all! I have been gathering contact info on everyone, and cannot find email addresses for several of you. It would be SO helpful if you could email me with YOUR email address - specifically those of you with a blog but without an email address listed on your profile page, and those of you who don't have a blog. I'm at smithkaichjones(at)aol(dot)com. Also - Anyone without a blog especially needs to email me so we can figure a way to present your stuff to everyone on the 23rd. I love this and I want to win, but I can't quite figure out how to enter. Will this comment get me in the mix? Rhonda - yes. I've just listed you in the sidebar. I will need your email address, or we can hook up via: FB. There will need to be some way to show your entry to everyone else - since you don't have a blog, either youtube or sent to me so I can post here. :) SO glad to see you here!! And of course...I have to play too, although I don't know if I have any words left...I've used so many of them this year. can i still join in? i'm not sure how i missed this. I have just discovered your blog today! I have been missing something wonderful! If it isn't too late I would like to participate. either way I will be posting my thoughts tomorrow on your post. I am so happy you have found your way back to painting! Tami - Not too late at all - welcome!!! I've added your name to the list on the sidebar & will see you tomorrow! PS - And thank you! Patty - You are in. :) can't wait to see you tomorrow!! Yes, it will be a bit of a scramble...just found this today...but I'll show up tomorrow with something! So glad I found out in time to play along. I'll rise to the occasion and put it on my "regular" blog (meriak.blogspot.com) instead of my meme blog.